Spoilers for Cult of Chucky follow. Cult of Chucky is one big reunion. Don Mancini's latest gathers the franchise's most iconic characters (Chucky, Andy, Tiffany, Nica) and sends them to a mental hospital, where storylines intersect and the cinematic universe gets a game-changing voodoo update. It's a fun party. But you have to stick around after the credits for the best guest, another familiar face who tees up yet another sequel. Cult picks up not long after Curse of Chucky, Nica having been sent to the asylum for allegedly murdering the remaining members of her family. To start, things resemble the what's-true-what's-not paranoia of Martin Scorsese's Shutter Island -- until Chucky returns with the ability to occupy multiple vessels at once. 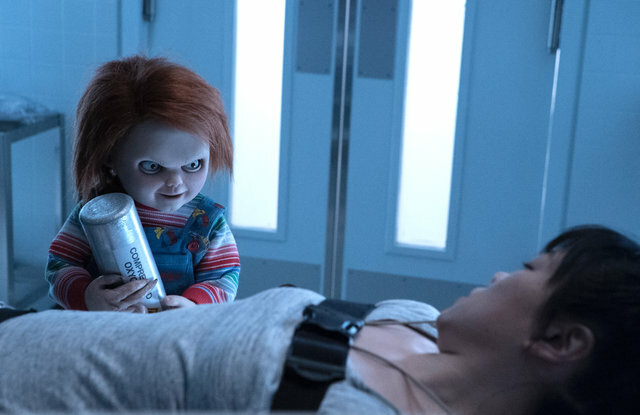 His new spell surprises Nica and Andy Barclay, the grown-up Child's Play protagonist who returned after the end credits of Curse to thwart Chucky and hold him captive. "I hope I've set the precedent that I don't do anything cavalierly," Mancini explained over the phone. "Like in Curse of Chucky, just having that little taste of Andy [after the credits]? Well, now we have a pretty decent main course of Andy in this one. So goes it with Kyle [whom we last saw in Child's Play 2], with this movie." What does this mean for the inevitable sequel? "The fight's not over," Mancini added. "Chucky has the upper hand now. Andy's locked in that room, in that padded cell. So I think Chucky, in the form of that doll, is just biding his time. It's sort of like Catherine Tramell at the end of Basic Instinct. You know, she's got Nick Curran in her bed and the ice pick under the bed, but she's gonna wait, because she doesn't have to hurry. That's what Chucky's doing. He's biding his time and savoring the moment, playing with his mouse before going in for the kill." In other words, Kyle has her work cut out for her.